For Cee’s Fun Foto Challenge, the theme is Peach or Apricot. Here is a peachy sunset for your pleasure today! This is a photo of the sunset over the Sacramento River delta looking northwest. After a fun day windsurfing, exhausted sailors enjoy an adult beverage with a spectacular view! 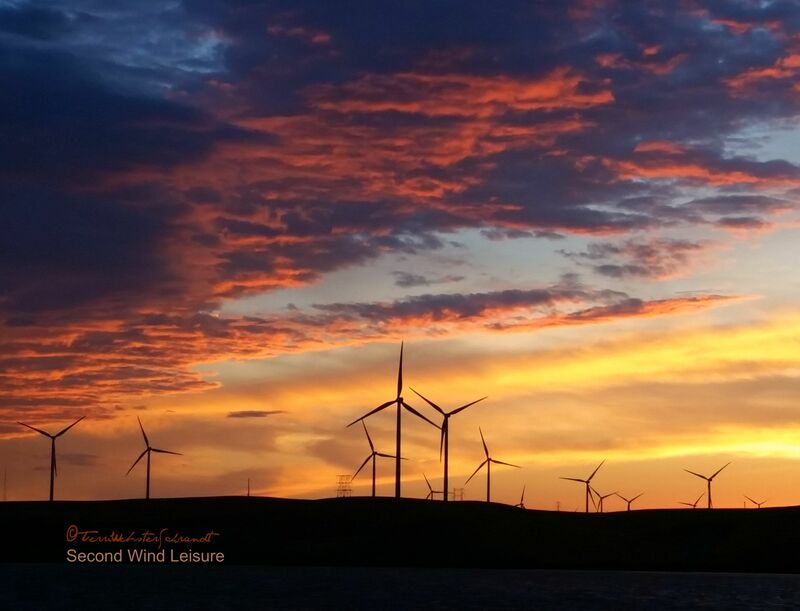 I love the silhouette windmills in your image..you have made a good contrast for the peachy sky. Beautiful image – oh, loving the windmills as silhouette 🙂 great color composition! Thank you, Indah, a high compliment coming from a photographer with your skills! Beautiful image for this week’s theme. Please make sure you connect it to my weekly post which comes out tomorrow. Thanks. Edwina, I definitely agree with you and Priceless Joy. Terri, you have a superb photographic eye. You hit the target every time in all these challenges.